We operate 8 of these 2 seat trainers 2 of which are Aerobat's. They are primarily used for PPL training, however the Aerobat's are ideal for Flight Instructor training as they can be used for the spinning element. 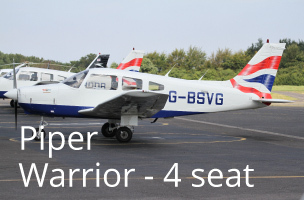 We operate 5 of these 4 seat aircraft. With a higher cruising speed than the C152 they are ideal for our members who wish to visit the near continent or fly further within the UK. They are also available for PPL training. 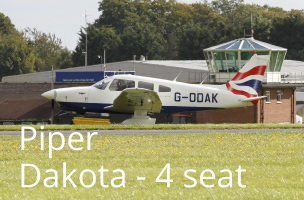 The Piper Dakota, G-ODAK, has a 6 cylinder engine and variable pitch propeller allowing it to cruise 20-30kts faster than the Piper Warrior. It is ideal for those pilots looking for the "challenge" of learning to control a more powerful aircraft and tour even further or complete a Single Engine Instrument Rating. G-ODAK has been fitted with a G600 glass cockpit click here to find out more. Our Cessna 172, G-VOUS, is fully equipped with a G1000 integrated cockpit with traffic information. This technology is at the forefront of general aviation flying. 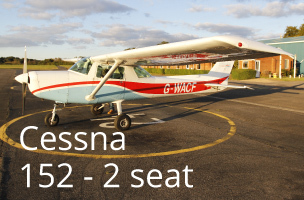 This aircraft is primarily used for touring however is available as an option for Single Engine Instrument Rating training. 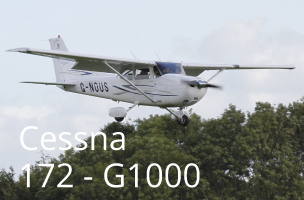 For those who prefer traditional avionics, we operate a very nice 172SP, G-OJAG. Our Piper Arrow, G-BHFJ, is a fully complex aircraft with variable pitch propeller and retractable undercarriage. It is perfect for Single Engine Commercial Pilot Licence and Instrument Rating training, differences training or touring further afield. G-BHFJ has recently had an avionics refit and now boasts a touchscreen Garmin G650 and Mode-S Transponder making it fully IFR equipped. 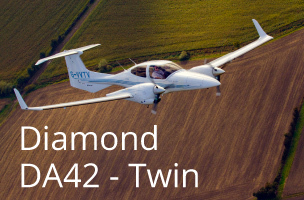 We have 3 DA42 twin engine aircraft. They are used for multi engine piston class rating and Instrument Rating training. The DA42 is equipped with a G1000 integrated cockpit solution and has single lever power control. We have 1 FNPT1 and 1 Alsim AL42 FNPT2 simulators. They are both used for the simulator elements of the commercial modules. The FNPT1 is approved for both single and multi engine configurations while the FNPT2 is solely used for multi engine training. The FNPT2 is also approved for Multi Engine Instrument Rating revalidations under certain criteria. Contact us for more details. More details on the Alsim can be found here.